Macron warns that City’s European influence and business could slide after Brexit. A good City Brexit deal is essential for the UK economy. Otherwise banks, asset managers, insurance and pension funds won’t have full access to the European Union’s (EU) single market. French President Emmanuel Macron issued the stark warning after talks with British Prime Minister Theresa May in London last week. 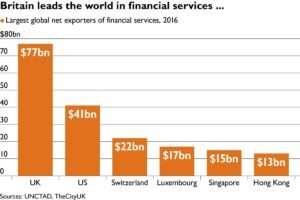 Bankers fear that if France and the rest of the EU place restrictions on UK financial services, competitors will hone in on the City of London. The Global Financial Centres Index (GFCI), calculates that London is the leading global financial centre. New York, Singapore, Hong Kong and Tokyo are the next in line. 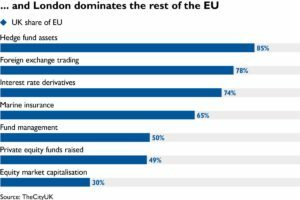 Unfortunately for Londoners, the city’s ranking could well decline after Brexit. The city’s foreign exchange, securities and derivatives trading would decline. Mergers and acquisitions and new initial public offerings business could also gravitate to New York and other competitors. This would be a blow to the UK economy. Financial services account for about 12 percent of Britain’s economic output, estimates the City of London Corporation. The sector employs more than 3 percent of the nation’s workforce. Tax generated pays for 11 per cent of total public spending. Moreover, while imports of goods exceed exports by a wide margin, financial services trade has a large surplus. In a BBC interview, Mr Macron admitted that France wanted “to attract the maximum activity” in financial markets. Hardly surprising. Paris’ GFCI ranking is way down at 29th place, compared with Zurich (9th), Frankfurt (19th) and Geneva (23rd). Despite the sanguine response, bankers are concerned. Luxembourg based European Investment Bank (EIB), disclosed, for example, that new loans to the UK tumbled by two thirds to £1.89 billion ($2.59 billion) last year. EIB president Werner Hoyer said that UK withdrawal from the EIB would be “quite a blow” to the bank and damage the UK. He added that the UK did not have a well-established state institution dedicated to development finance.